Let me tell you guys, it pays visiting Erich's Wuerstelstand frequently, not only because of the best sausages and bread in town, but there is a always a chance to meet interesting people there. The night before the German match was such day. First Donny Osmond (in town for his concert) and his family strolled peacefully, because unrecognized around Chinatown and passed Erich's Kiosk as well. However the sharp and observing eyes of Frank N. Furter spotted him and welcomed him in Singapore. We didn't want to distrub his privacy therefore no photos. Then there was this "new" guy at Erich's with a back bag full of samples. 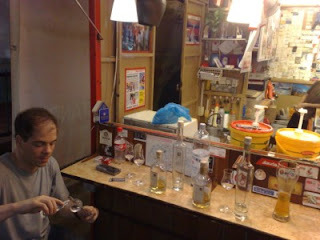 Daniel is here to stay for a few years to market the best Austrian Schnapps products. Lucky the few who were able to taste them all. Deeb & Co uses the best fruits for Schnapps production and no chemicals are added. Some of the delicious and very tasty samples we consumed were: Raspberry, Plum, Apricot, Beer, Rowan Berry, a single Malt Whisky and a clear Banana Schnapps. 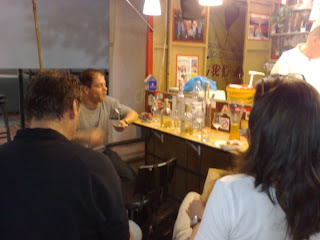 And "Yes" we were still able to watch the soccer match later this night!!!! Daniel told us that email orders are available. We'll keep you posted on our blog when there are new developments.